[Video] S.H.E Selina 3rd Degree Burn Injuries. How It Happened? Just saw the video people sharing on Facebook about S.HE Selina had 3rd degree burn injuries during the filming "我和春天有个约会" in Shanghai. 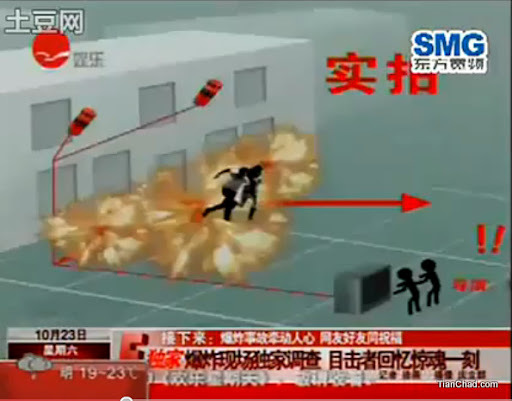 This video show the reporters visited the explosion filming site. The five different bomb spots were supposed to ignite at different time when both Selina and Yu HaoMing [俞灝明] running out from the building. Unfortunately the bombs exploded faster than they expected and all 5 bombs exploded at the same time when they reach the door way only. Both of them were on fire. According to the video, Selina was shouting in pain and wasn't able to walk. For now director still haven't officially reply any calls from the reporters. Besides, not sure what would happen to the guy who responsible to ignite the explosive point. I believe there should be more safety precautions to prevent this happen. I am not sure if they have did some trial before the recording but we do know that explosive are expensive. Selina 3rd Degree Burn Injury. How it Happen? Sorry to hear this and I hope every fans of Selina and Haoming can pray for both of them to recover as soon as possible. As what Selina's dad said, Selina has made through the biggest incident in her life and I hope she will stay strong. OMG! I heard about it few days back... but ddnt manage to find any video. Yeah, hope both of them recover soon!